The Black Sun class Battlecruisers are some of the largest ships constructed by any group in the orbital community. The only ships equaling these ships in size are some huge merchant ships and they have comparatively tiny crew to the battlecruisers. The Back Sun class Battlecruisers themselves are constructed by Laika Station and a total of three have so far been completed. One ship was kept by Laika station, one was sold to the Moon Colony, and one has been sold to Freedom Station. There is a ship under construction for Yuro station but the various factions on the station are arguing about which group will control the ship and which group will actually pay for the ship. Each of these ships took or will take between eight and ten years to construct each and cost a small fortune each. The ship design is based on a pre flash Merchant style hull but is very heavily modified and very well armed. The ship hull has four large engines and four smaller engines in the rear of the ship. Immediately before the engines is the wide section of the ships body that is constructed in an octagonal design with a weapon cluster that is on the top and the bottom of the design. The command center is in the middle of this section. In front of that, the ship narrows and the nose of the whip is much narrower than the rear of the ship. The systems on the ship are more advanced than most of those used on Rifts Earth but are on average less advanced than Pre-Rifts designs or those from Japan or the New German Republic. All in all, though, these ships are formidable. They have advanced radar systems but unfortunately the Neutrino sensor technology was only just developed and none of the technology had made it to any of the orbital powers except the U.S.S.F. and E.S.D.F. by the time of the Flash. The radar is a phased array system but is not as effective as the systems on the U.S.S.F. or E.S.D.F. ships. The radar system is mounted on both the front, rear, and sides of the ships. The ship is constructed using hardened circuits and has multiple jamming systems and protective systems. The ships are propelled by eight pulse fusion engines. The four larger engines provide the ship with two thirds or the thrust and the smaller thrusters give about one third of the ship’s propulsion. These engines provide for both fast accelerations and for long distance operations. The engine uses reaction mass in the form of deuterium and helium 3. Most of the fuel is carried in a frozen form to increase the storage ability of the ship. This gives the ship a three month endurance. If the ship decelerates, the ship will flip so that it is traveling rear first and activate the ship’s main engines. The ship weapon systems are quite respectable and can easily beat most ship designs operated within the Orbital Community. The one weakness is the entire main battery fires forward. The ship has 4 heavy laser cannons that fire forward that are capable of inflicting severe damage to large ships. These are located on pylons of the top and bottom of the ship. The ship has eight rail guns that are useful against missiles, fighters, and starships. The ship has been outfitted with a new creation, Ion CIWS weapons to destroy incoming missiles and aircraft. The ships are also well equipped with missile batteries and has a total four heavy missile launchers. For defense against missiles, along with the CIWS systems, the ship also carries two anti-missile mini missile launchers. As a final defense, the ship has two chaff launchers. Except for the ship that has been modified for service for Freedom Station (The only Station that uses simulated gravity create by rotating), none of the ships have simulated gravity. The ship that is in Freedom Stations service has the middle area modified with a rotating section. Even so, all the ships are as well equipped as they can be and have a small hydroponic section to supplement supplies and life support systems. All of the ships are laid out fairly traditionally and have decks from front of the ship to the rear of the ship. Because of a huge problem with the acceleration affecting the ship’s crews while in high G acceleration, the ships have a special chamber that uses high centrifugal force so that crew members can acclimate to the higher accelerations that the ship will use in combat. Each station that operates one of these ships have several of these chambers for initial training of starship crews as well. These ships are usually classified as Battlecruisers by the various stations but carry a sizeable number of both vehicles and power armors. This means they could be classified as carrier as well. The ship has space for up to 600 soldiers. Normally, the soldiers are only equipped with standard body armor and energy rifles but the ship in service with the C.A.N. Republic is outfitted with hardsuits although the numbers are dropped to 400 in that case. The ships also can carry a respectable number of heavy power armor or robot vehicles. The ship in service with Laika Station normally carry 60 L-7 Explorers (Soon to be replaced by L-12 Star Ravens). The Ship in service with Freedom station normally have 30 Mark III Glitter Boys, 20 Mark IV Glitter Boys, and 10 Mark V Glitter Boys. The C.A.N. Republic ship is normally protected by 25 MR-100 Samurai, 25 MR-200 Mikado, and 10 MR-1000 Steel Dragons. These robots are not the V.R.R.D.S. version because that would restrict the ships operating range severely. Depleting the M.D.C. of the main body will put the Battlecruiser out of commission. The space ship itself will be an unsalvageable floating wreck. The destruction of one sensor tower will cause a 25% reduction in sensor effectiveness. The destruction of two sensor towers will cause a 50% reduction in sensor effectiveness. The destruction of three sensor towers will cause a 75% reduction in sensor effectiveness. The destruction of all four sensor towers will effectively blind the ship except using fire control systems as sensors. Space Propulsion: The starship does not have an effective top speed but is limited by acceleration. The Battlecruiser can reach a top acceleration of 2.4 G but due to high fuel consumption and extra strain on the engines, the ship will normally accelerate at 0.3 G for any extended trips. Top acceleration is only meant for emergencies and combat maneuvers. Because the Battlecruiser is mostly unshielded from the effects of radiation and hypervelocity atomic particles (It is not completely unshielded), the Battlecruiser is not operated at speeds exceeding 20% of the speed of light. Maximum Range: Conditionally unlimited, while the fusion reactor gives power for a decade of service, the ship’s propulsion is limited by the ships reaction mass. The reaction mass consists of mainly Deuterium (Hydrogen 2) and Helium 3. The ship can be refueled at ground based (asteroid) facilities, space stations, and other star ships as long as they have the special facilities. The ship can also be refueled by fuel shuttles. The Cruiser carries 3 months of reaction mass for travel at 0.3 G of acceleration. Double the consumption of fuel for .6 G of acceleration and double the consumption again for every .6 G of acceleration beyond .6 G. This means the ship will burn the fuel 16 times faster at maximum thrust of 2.4 G than at 0.3 G of acceleration. The ship will often accelerate for a period of time and then shut down the engine and travel using the ship’s velocity. If the ship uses more than half of its reaction mass when accelerating, the ship will be unable to decelerate fully and the ship will normally only use a third or less of its fuel on accelerating so it does not run into a problem. If the ship runs out of fuel then it must be refueled by another vehicle traveling faster or be lost. The ship has a hydroponic section and with ships stores and the hydroponic ship is capable of operating for ten months without resupply. Main Engine: The Ship is powered by fusion reactors that will theoretically operate for 10 years and can provide effectively unlimited electrical power. However, it was recommended that the drive and power system have routine maintenance every 3 years. Also, the ship only carries about a three month supply of reaction mass. Cargo: Ship has six small cargo holds that are each 15 x 15 x 20 feet (4.5 x 4.5 x 6 meter) in dimensions. The ship has a total of 27,000 cubic feet (729 cubic meters). Each enlisted crew member has a small locker for personal items and uniforms. Ships officers have more space for personal items. Most of the ship’s spaces are taken up by extra ammo, armor, troops, weapons, engine, reaction mass, equipment, and hydroponics. Market Cost: These ships are very expensive to manufacture and Laika station sells these ships for 5.5 billion IOU each. 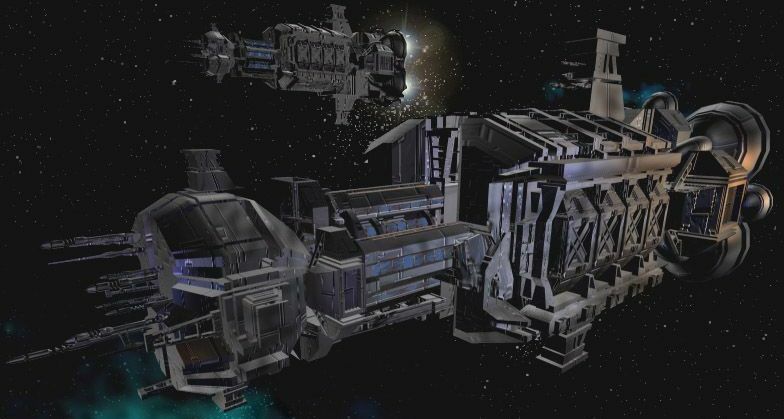 Four (4) Heavy Laser Cannons: These are the most powerful weapons available in the orbital community with the exception of weaponry from the United States Space Force and the European Space Defense Force. There are two cannons mounted on pylons on the top and bottom of the ship for a total of four cannons. Each cannon has an arc of fire of 60 degrees so they can be aimed without changing the position of the ship. Cannons can be fired together or individually. Cannons have standard penalties for heavy starship weaponry. Maximum Effective Range: 80 miles (128.8 km) in space and 4 miles (6.4 km) if fired into an atmosphere. Mega-Damage: 5D6x10 each (all four cannons can be combined for up to 2D6x100). Rate of Fire: 2 bursts per cannon per melee. Eight (8) Rail Guns Turrets: Four turrets are mounted on either side of the hull of the ship. Each rail gun turret can rotate 360 degrees and has a 180 degree arc of fire. These weapons are used against full size starships, against fighters, and as anti-missile point defense. Maximum Effective Range: 10 miles (16 km) in space and 6,000 feet (1,830 meters) if fired into an atmosphere. Six (6) Light Ion CIWS Turrets: The ship has a turret mount on each side of the ship. Each system is automated and fires Ion pulses at missiles and attacking fighters. The targeting system can be overridden and be used to target larger targets as well. The system uses radar to track incoming targets (Has +2 to strike missile and to strike aircraft). This point defense system is a relatively new system for starships constructed in the orbital community but is not as effective as those mounted on the Pre-Rifts Washington and De Ruyter. Maximum Effective Range: 6 miles (9.6 km) in space and 4,000 feet (1,220 meters) if fired into an atmosphere. Four (4) Long Range Missile batteries: All four of these launchers are mounted on the front of the ship. These launchers are both used to launch anti-ship strikes and to launch against starfighters. Missiles are assumed to accelerate at 2 times normal mach speed in Gs greater than the starships speed when used in space. Missiles can be launched at non moving targets beyond the powered range of the missiles to hit targets without the chance of the launching ship being hit by missiles itself. Each of these launchers can be targeted and fired at multiple targets. The missiles normally used are Smart Missiles. Rate of Fire: Can fire missiles one at a time, or volleys of two (2), four (4), or eight (8) missiles per launcher (32 max per volley with all launchers). Payload: 96 Total with 24 each launcher. The ship has an additional 96 missile in storage. Two (2) Anti-Missile Mini Missile Launchers: The ship had one launcher on the top of the ship and one launcher at the bottom of the ship. The system is an automated system that launches ten fragmentation or plasma mini missiles at a volley of enemy missiles. If the volley is tightly clustered, then the mini missile will automatically destroy the volley, but if the volley is widely separated, then the mini missile will target two mini missiles at each incoming missile and will target up five incoming missiles per launcher. Each system has 5 individual laser targeting systems to guide missiles. Missile are assumed to accelerate at 2 times normal mach speed in Gs greater than the starships speed when used in space. Two (2) Chaff Throwers: This system launches clouds of chaff around the ship. The chaff are canisters of thousands of small pieces of highly reflective aluminum. The chaff will remain around the ship for a period of time unless the ship accelerates, decelerates, or changes course which will take the ship out of the chaff cloud within one melee. All launchers must launch or ship will only have partial effects. Each reduction of a launcher will reduce effectiveness by 50%. Rifts Earth and Mutants In Orbit decoys systems are assumed to not operate on Phase World missiles due to technological difference. Payload: 100 Cylinders of chaff (50 per launcher). Hardened Circuitry and Electromagnetic Shielding: All electronics and computers on the star ship are constructed with hardened circuitry and the ship itself is built with shielding to prevent EMP and jamming from damaging circuitry. The effect is that jamming and EMP will not damage any system while it can blind the ships radar and radio communication system. Laser systems will not be affected by jamming. Jamming System: This system scrambles all electronic signals for a range of 8,000 miles (12,875 km) in space and will penetrate an atmosphere for a distance of 80 miles (128.8 km). The system can also confuse missiles. It has a 45% chance of confusing missiles but some missiles can home on jamming signals. Magnetic Shield: The ship has special generators that generate a magnetic field. This field reduces the effects of particle beam weaponry. It causes particle beams and Ion cannons to do half damage. The magnetic field can sometimes also confuse ordinary missiles but not smart missiles. It has a 35% chance of confusing the missiles. If operating at the same time as the jamming systems, do not roll for this system to confuse non smart missiles. Phase Array Radar System: This system was developed from the Aegis system that was used on many naval vessels but is much less advanced than the system carried on the De Ruyter and George Washington. Powerful and flexible radar system that is comprised of four panels that each emit radar waves. The radar system is mounted on both the front, rear, and sides of the ships and are used for both fire control and tracking. The system has a range of 50,000 miles (80,500 km) in space and can penetrate the atmosphere up to 500 miles (8,050 km). The system can track and identify 1024 targets at on time. Can also target each individual missile to a separate target at up to 256 targets. Image drawn and copyrighted by Andrew Blinn (andreworld@hotmail.com) .